Indian Weddings are dreamy events. Every ritual is meticulously planned and executed with flair and joy. It’s a dream come true for the beautiful couple and the lovely parents. 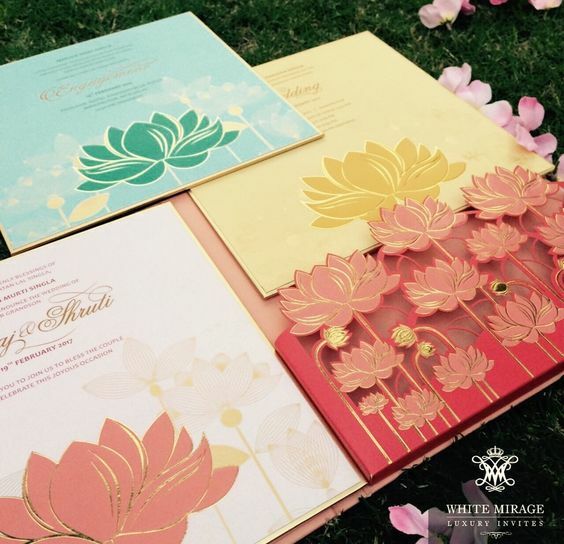 Everything leading to your special day should be exceptionally beautiful including your wedding invitation card design. 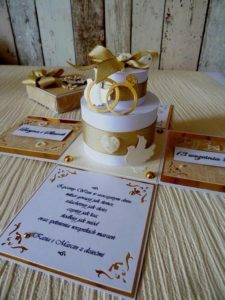 Your confusion to select the best wedding invitation card design and theme for your wedding card is perfectly understandable. 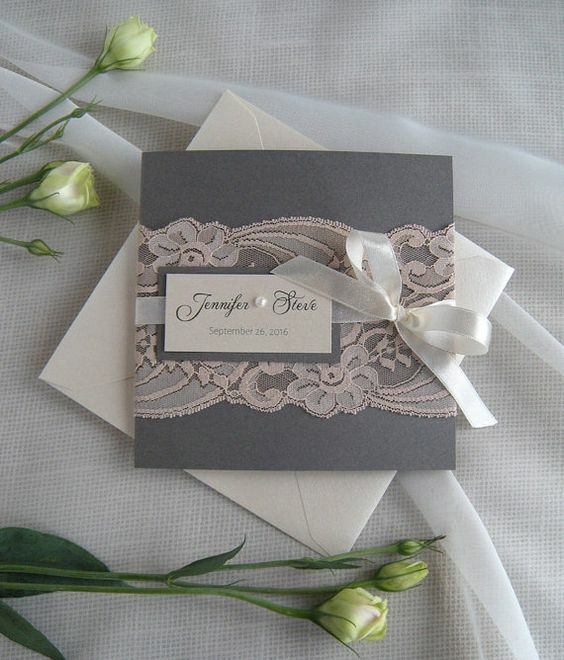 To ease your stress, TBG team has listed 10 great wedding invitation card design ideas here. Go on to read and choose the most creative one for your D-day invite!! Have a destination wedding planned at the serene beaches of Goa or in Ernakulam in Kerala? The best way to excite your guests for the destination extravaganza is a localized card. For Kerala, choose a card which shows houseboats, luxury resorts and backwaters whereas for a wedding in Goa, go for cards that have spectacular pictures of guitar, clear crystal beaches, beer bottles, coconut trees or anything and everything that speaks for the spirit of Goa. Isn’t it a creative idea to invite your guests as well as excite them to be a part of your special day in a faraway location? Go and decide your wedding destination today! Water Colored Beach Wedding Invitation for Destination Wedding. Wedding card Box invitation are very much known for Celebrity or Big fat weddings and these Box invitations are famous for their Luxury and elegant gifting ideas for the Wedding Guests. 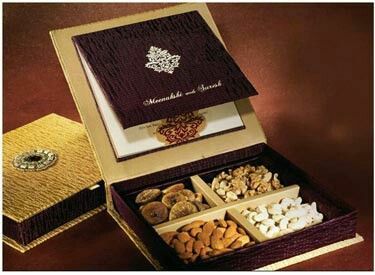 You can customize the box with chocolates, sweets, Haldi & Kumkum or any gift like Lord Ganesha or goddess Lakshmi Idol along with the wedding card. Plant love & let the memory of your wedding day live on with seed paper wedding invitations!! Available in a variety of customizable colors and designed with matching favor tags, place cards, menus & more, there is something for every bride & groom to be. These Newly invented wedding Invitations are designed to spread Seeds of Love. These stylish and eco-friendly wedding invitations that grow into flowers or herbs instead of leaving waste behind!! So these seed paper is a beautiful eco-friendly choice for truly green invitations and is perfect for true Nature Lovers. Plantable wedding invitations are printed on seed paper that grows wildflowers (veggie or herbs if you choose) when the invitation is planted in soil. Invitations are printed on a thick recycled paper cardstock and come with a seed paper band to wrap around the invitation. Recipients can plant the band and keep the rest as a memento!! 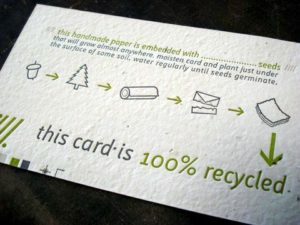 Plantable paper is a biodegradable eco-paper that is made with post-consumer materials (no trees harmed for this paper!) and embedded with seeds. When the paper is planted in a pot of soil, the seeds grow and the paper composts away. All that is left behind is flowers, herbs or vegetables, and no waste. It’s easy to plant and grow. Your fairy-tale wedding deserves a dreamy invitation that speaks for your style, royalty and the grandiosity of your impending wedding affair! Its exclusive design looks a piece of art straight out of a royal property. The intricate design and detailing is a sight to behold. A classic wedding card design never goes out of vogue and indeed impresses each invitee. These 3D popup wedding Invitations are perfect If you are planning to add some majestic feel to your invitation. 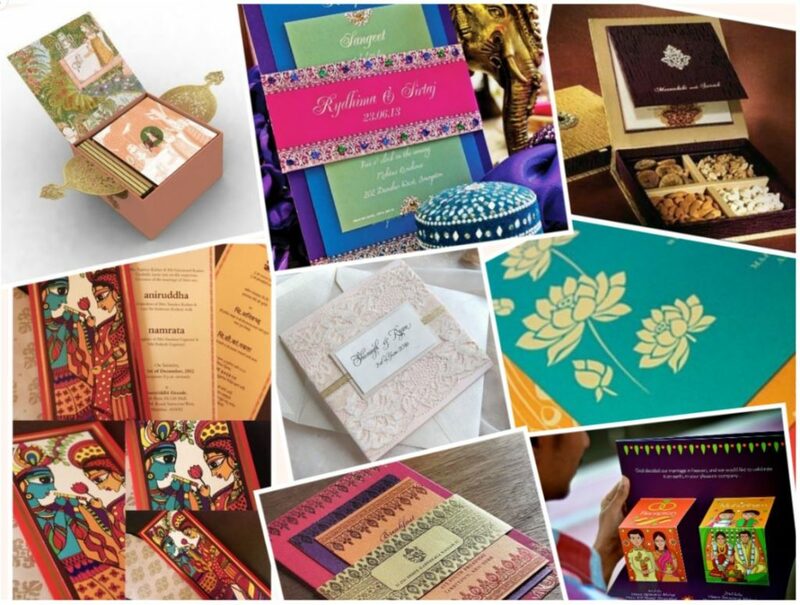 This creative invite card is full of happy pop-ups that depict the beauty of each happening in our very own Indian Wedding. A one of the kind pop-up invite designed by ATMA studios that signifies a traditional union of two hearts and each pops up with a picture and event details. you can even plan for multiple 3D pop-up boxes in each card. Price range varied based on the number of pop-up cards. If you want your wedding to be special and every single aspect of your wedding to be remembered for years to come then these traditional religious prints are a perfect choice. Kalamkari or Bapu Bommala or MadhuBani religious Art inspired painting cards are in peak nowadays which is perfectly suitable for people who seek ethnic Indian themes with a classy twist. Look at the contemporary card designed in such a way that it brings out the rich cultural heritage of traditional India into classy designs. MadhuBani Art Wedding Invitation Cards. 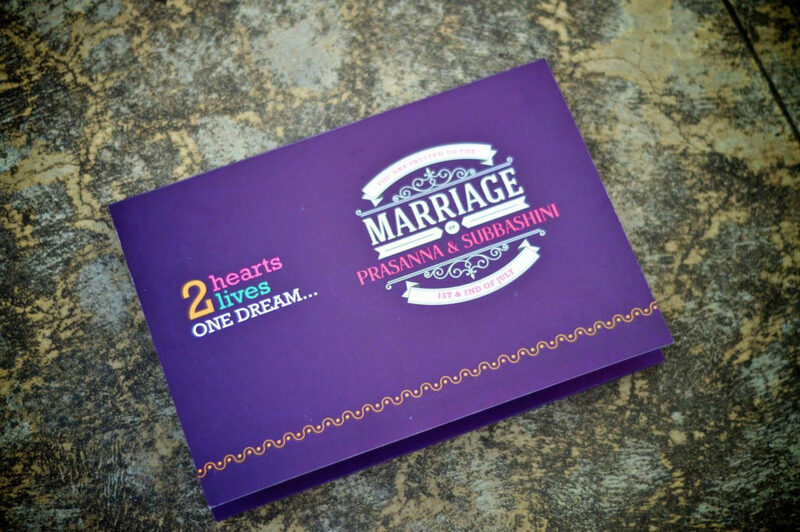 oviyadesignstudios designed a wedding invitation for a spectacular South Indian Wedding who has gone for 2 days wedding. The picture-perfect illustrations capture the essence of the events in detail. The welcome ceremony, Engagement, Reception, Muhurtham, Pooja – this unique invite has it all. A perfect invite for your friends and guests who will get a flavor of what to expect on the important day of your life. Tired of boring old wedding Invitations? If you want something really different, you may opt for Illustrated wedding cards. Cute Cartoon- caricature invite is the new Personal trend on the block that must be incorporated in your Wedding. A great way of reflecting your personality and sense of humor to the celebration with funny and fancy cartoons. 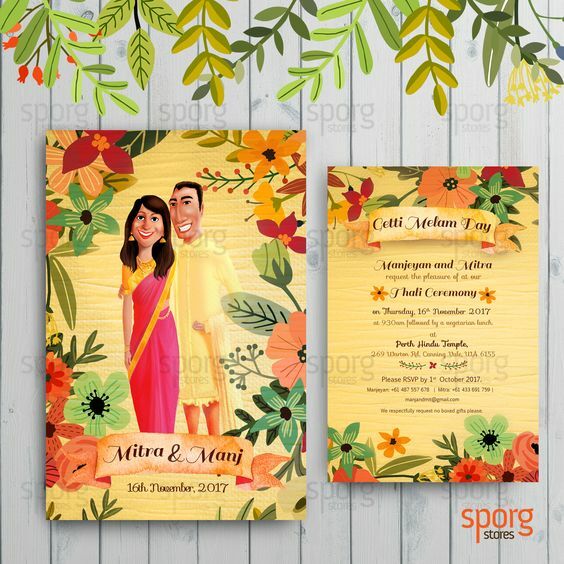 Look at the Sporg studio created caricature Illustrated wedding invitation with floral wedding card designed for Australian & Srilankan Tamil couple. The social media like Facebook, Instagram are ruling the world of the modern Internet generation. 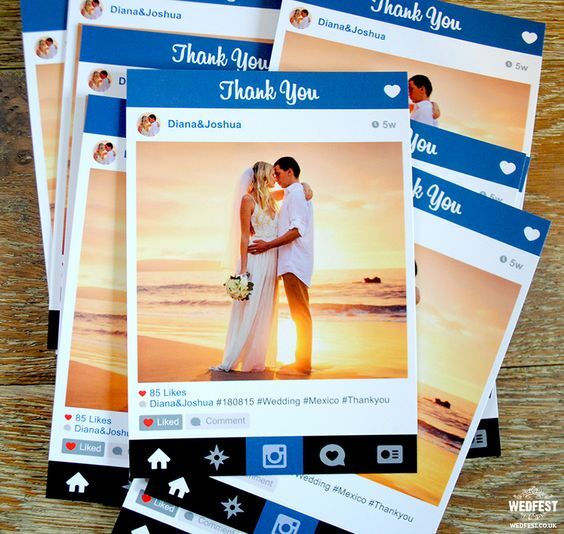 You may actually duplicate the internet world by going for social media theme for your wedding. You may even opt for card designs that are quite similar to various internet websites Facebook or Instagram. The younger generation can surely approve of it. When you are planning for a themed wedding Why don’t you go for a similarly themed wedding card ?? The modern generation has a lot of unique ideas in every aspect and It will be more creative when it comes to weddings. There are several benefits of opting for this style. you can create a sequence of events and publish them differently and interestingly and Also you can create enthusiasm for your guests and definitely they feel special or unique for sure. 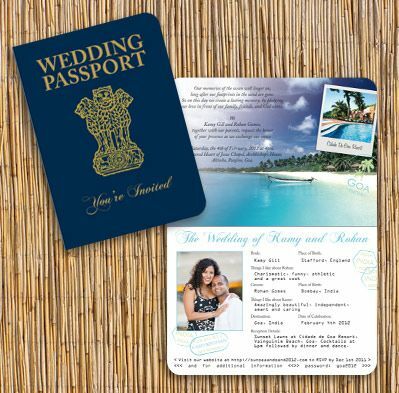 Passport or Boarding Pass is suitable themed wedding invitations when you are planning for a destination wedding or going for NRI groom or bride. To make it more innovative you can Print the couple picture and content same as Indian pass port style or Boarding pass style. Look at this Indian Wedding Passport designed in traditional colours of navy and gold for the front cover and incorporated the real Indian Passport emblem along with the wording “Wedding Passport” and “You’re Invited”. a man who would walk through the streets announcing in a loud voice the news of the day. Traditionally, anyone within earshot became part of the celebration. You can invite friends and family to paradise with this unique Beach Paradise printed Boarding Pass Invitation if you are planning for a destination wedding in any Beach. Laser cut invitations are one of the trending design in recent times. 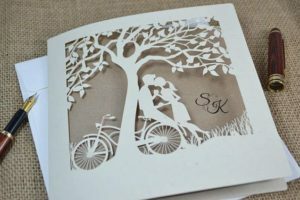 It was times when laser cut invitation are designed with the heart theme and simple designs, but now laser cut invitation is designed in a more creative way as shown in the image below. 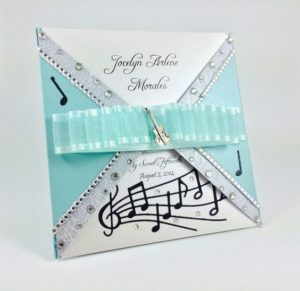 If you are a music lover then why don’t you go for a musical themed wedding card for your wedding? 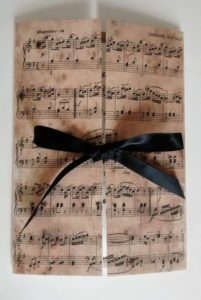 This will give a feel of an odd man out from normal invitation cards and it will also showcase your love for music! You can even try out an amusing music record on your wedding card. We all would be aware of exploding gifts which we present to our friends or lover but exploding wedding invitation card is something interesting! Surprise your guests by giving an exploding wedding invitation and give a pleasant surprise to them! 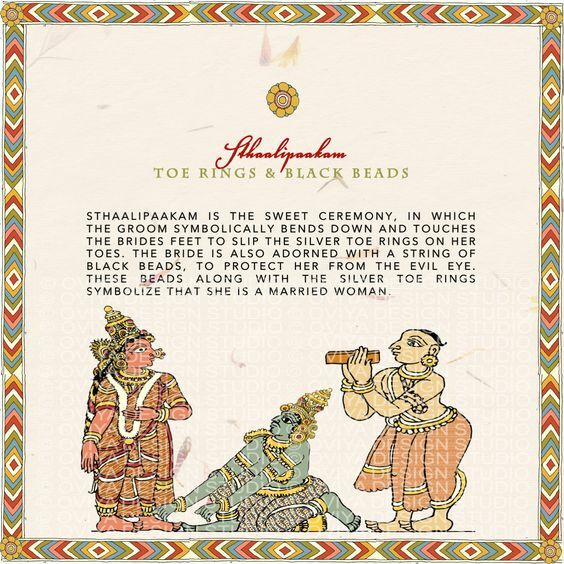 In Ancient Hindu days, wedding invitations were typically verbalized. In fact, they were usually issued in a loud manner. If someone heard the invitation, they could attend the wedding, unless of course there was enmity between the families. These invitations were typically announced by a town crier, a man who would walk through the streets announcing in a loud voice the news of the day. Only Royal families were inviting other kings through the properly written invitation. The monks and Sages were well known for their beautiful hand writing called as calligraphy. Many of these families also had the family crest added to the invitation. This was also used as a means for identifying the family to those who were virtually illiterate. Metal like Gold or silver plates were used for Royal invitation along with fruits, precious gems, and gifts for the guests to reflect their grandeur. When printing presses came into the picture, these Printable wedding cards came to life and that continued till 20th century with improved color prints, glitters, patterns, and text templates. During the latest Internet days E-cards grabbed all the attraction of people which are paperless, eco-friendly, time and money saving but still printing wedding invitation has its own importance. Hope these Ideas helps you to select the best wedding card for your big day.